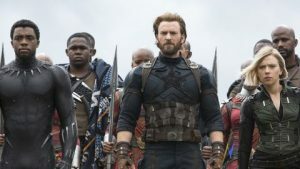 Avengers: Infinity War is the culmination of the previous 10 years and 18 films of Marvel movies, and while the task of creating it must have been impossible, the Russo brothers, who also directed Captain America: The Winter Soldier and Civil War. pulled it off, and they pulled it off incredibly well. This review will be SPOILER-FREE, and will contain absolutely no spoilers for Infinity War. The movie follows Thanos (Josh Brolin), who is on a path to collect all of the Infinity Stones, which would give him the power to wipe out half of the universe and more, and the Avengers’ attempts to stop him. Every movie in the Marvel Cinematic Universe since Iron Man, or more directly, The Avengers has been leading up to this and it manages to juggle an incredible cast of characters without falling over, largely due to the handling of it from directors Joe and Anthony Russo. 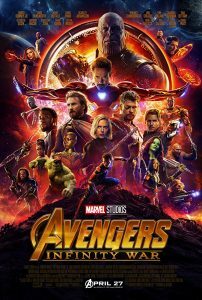 Avengers: Infinity War is an emotional, hilarious, sprawling ride that really doesn’t let you go for any of its near 3 hour runtime. It’s amazing just how huge this movie is: it takes characters that you’ve grown to know and love over the course of the last 18 movies and puts them in a place where you feel real peril. 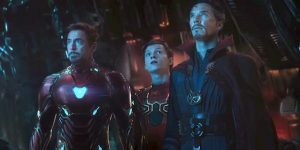 And quite possibly the most…awesome part of Infinity War is how it lets you see these heroes in ridiculously entertaining combinations you never imagined and it plays this up for maximum effect. It comes pretty close to being perfect, but sadly, is not and runs into some problems just because of the sheer size of its cast. The tone of this movie is something very interesting, as it manages to take each individual feel of all of the previous movies and combine them in a way that highlights each hero. However, this tone does feel a bit jumbled sometimes, as it moves from dark to a bit too jokey. This is also one of the darkest Marvel movies yet, with heroes put in a situation that none of them are prepared for. Marvel’s been killing it with their villains this year, with Killmonger and now Thanos, who ties with Killmonger and Loki as the best Marvel villain yet. First off, the CGI on Josh Brolin through motion capture is amazing: Thanos really does look great and he really needed to, as he interacts with humans for so much of the movie. 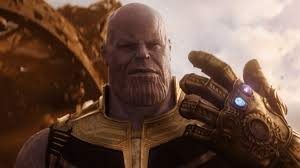 This is not a villain who is evil for the sake of being evil: Thanos is the star of this movie, and it is told mainly from his perspective, which is both refreshing and super compelling to watch. He gets development, and you really get to see why he’s doing what he’s doing and you even sympathize with him. And Josh Brolin’s performance is fantastic, which really drives the whole thing home. And perhaps the most anticipated part of the movie, the character dynamics. What I myself was most excited about here was seeing these characters get to interact in new ways, and it definitely delivers. The heroes are paired up in really fun, exciting ways and get to play off each other a lot. This feels like a blockbuster Marvel movie in a lot of ways, and the action is phenomenal. It’s like nothing you’ve seen before and is really stunning. The heroes get to interact in really fun ways that make the action super entertaining, especially in the third act. It’s amazing how it’s all done in the end, and the movie switches between a few fight sequences pretty deftly, always keeping you engrossed in them. The fight choreography here is like if the airport battle in Captain America: Civil War were blown up to include every superhero from every MCU movie yet. It’s truly dazzling and is so entertaining to watch. The visuals in this movie are the best that the MCU has done yet. Black Panther had pretty spotty CGI, but this utilizes all of its budget and really makes everything feel realistic. So much of it is CGI and how believable everything looks and how we’re transported into this world is incredible. Between some completely CGI characters and some entirely CGI locations, this film really deserves credit in this area. 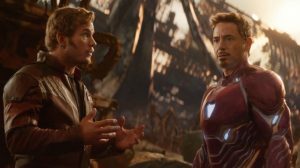 Avengers: Infinity War is also a super funny movie. The character dynamics, as said before, bring a lot of humor, and all of it hits hard. Despite how dour and hopeless it may seem, there are a lot of crowd-pleasing, genuinely hilarious jokes in this movie largely due to so many characters getting to interact for the first time. In a lot of blockbuster movies today, the plot shows that the universe is at stake, but we never really feel that peril and danger. Here, because we’ve gotten to know all of these characters and because of the legitimately terrifying villain, we feel like our characters are in danger. This movie is possibly the most emotional Marvel movie yet. No spoilers, but it makes some extremely unexpected choices and the audience is definitely very affected by the emotional stakes. There are also some very devastating surprises, jaw-dropping surprises that is sure to keep the audience guessing, and they are extremely effective. The shocking ending is arguably the best part of the movie and made me extremely intrigued as to what will happen in the sequel next year. This movie manages to not only fulfill what you wanted out of it, but leaves you at a cliffhanger that makes the wait for next year’s Avengers 4 very, very hard. Infinity War is almost three hours, but definitely doesn’t feel it. It doesn’t let go until the credits roll, and is a sprawling, very well-paced movie. The way that it’s edited allows you to feel the weight of all of the storylines at the same time, and there’s close to nothing that feels too dragged out. However, there are a few parts around the first two acts that could have been cut down, which I’LL touch on later. Every storyline is moving with such urgency, especially in the second half to defeat this villain that you get caught up with it and don’t really feel the runtime. My main issue with this movie is that not all of the heroes get to be in the spotlight. Obviously, with as many characters as there are, it would be impossible for them all to get a chance to shine, but there were some heroes who were made out to have a bigger role that ended up being…just there. While the movie is incredibly satisfying in a lot of aspects, it felt lacking here. Some areas in the first half really could have been cut out to give some characters more of a leading role. This movie will really not make as much of an impact if you haven’t seen any of the other Marvel movies. It also requires a bit of prior knowledge, but not so much that movie doesn’t make sense if you haven’t seen any of them. If you’re not a fan of superhero movies, this is not the movie for you, as is a lot of that. If you’ve seen at least 3 or 4 Marvel movies, you will care about these characters and it will make a very large impact on you. But for fans who have seen every MCU movie, this movie will be immensely satisfying (make sure to stay for the post-credits teaser!). 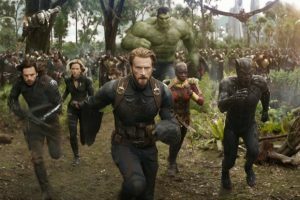 Avengers: Infinity War is a movie that is pretty close to being perfect. It’s based around the villain, but lucky for it, that villain is great. It has spectacular action, a few emotionally crushing twists, and awesome combinations of characters that you know and love. This is a movie that was definitely made for the fans, but is so much more than that. It’s a movie that had so much pressure leading up to it, but worked incredibly well. Cool to see it all come together after 10 years. Looking forward to seeing this.